After visiting Ōe Shrine we carried on walking to the nearest train station to get the train to Osaka Castle. 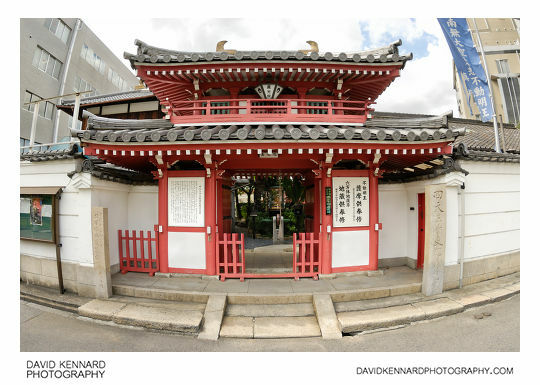 On the way to the station we walked past the entrance to the temple Shoman-in Aizen-do (勝鬘院 愛染堂). It was originally founded as a Seyakuin (施薬院), where medicinal herbs would be grown and used to treat the poor. The temple is apparently popular with young women and couples because the god of good matchmaking and happy marriage, Aizen-Myoo (愛染明王), is enshrined at the temple. We didn't go in and look at the temple as time was getting on and we wanted to go and see Osaka Castle. 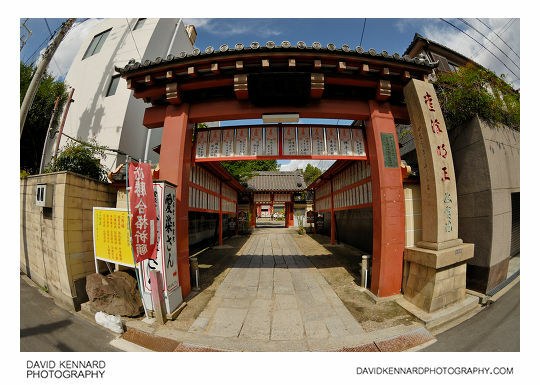 Round the corner is another temple, Shitennoji Shinkoin (四天王寺 真光院), which you can see the entrance of above. 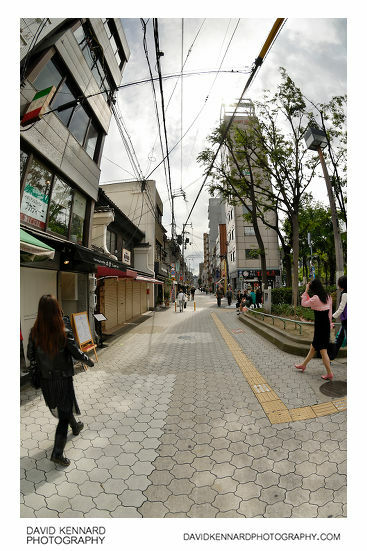 This is a shopping street near one of the entrances to Shitennoji-mae Yuhigaoka Station. Lots of streets in Japan don't have names unless they are a major road. I don't think this street has a name. We went down into the station to get a train ticket, but were rather confused by the Japanese ticket system. Thankfully a helpful Japanese guy that spoke English helped out. Rather than buying a ticket to a destination, you need to look up how much it costs to get to your destination from that station. A list of stops and prices is usually on the wall near the ticket machines. Then you buy a ticket for that price. Personally I find the UK system of just entering the name of the station you want to travel to into the ticketing machine much faster and easier. We took the train to Tanimachi Yonchōme Station, which is near Osaka castle. 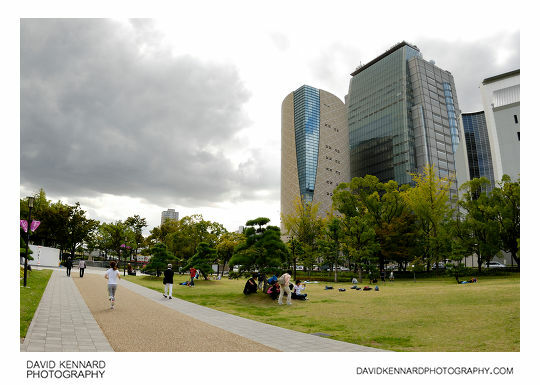 Near the station are a few large modern buildings, the above shot is of the Osaka Prefectural Police Headquarters Building (大阪府警察本部棟; Ōsaka-fu keisatsu honbu tō). 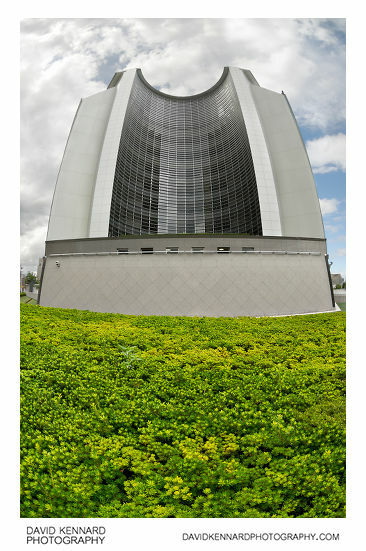 The building was designed by the famous Japanese architect Kisho Kurokawa (黒川 紀章; Kurokawa Kishō), and is designed to be efficient and environmentally friendly. The building is located just across the road to the west of Osaka Castle. 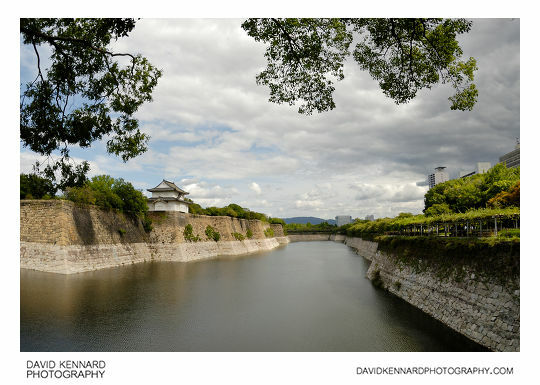 Osaka Castle has a very large outer moat. In the photo above you can also see one of the remaining turrets, Rokuban-yagura (六番櫓), which means 'sixth turret'. The turrets were built on the edge on the outer bailey, allowing the defenders to shoot any attackers on the other side of the moat from the safety of the turret. In the photo above you can see part of the Osaka Prefectural Police Headquarters on the right edge of the photo. 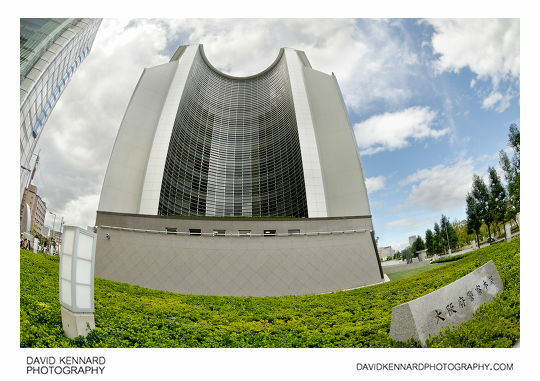 To the left of that is the NHK Osaka Broadcasting centre, and then the Osaka Museum of History. As you can see, lots of people enjoy relaxing on the grass in the park (like most parks). Next we went on into the castle.